On the shelf at Nicole Antebi's video installation show. 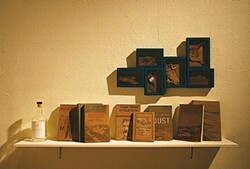 A large video projection plays on one wall across the room from shelves of the props: painted backdrops, small pen-and-ink portraits, objects made from cut paper and a glass bottle with a handmade label. Watching the video feels like stumbling on an educational channel with weirdly imaginative programming. The pacing is stately, the mood is contemplative and the language is sometimes academic. This installation is part of the bookish, engrossing show at College of the Redwoods this week that marks Brooklyn-based Nicole Antebi's Humboldt debut. Antebi uses pen, pencil, ink, wash, animation and first-person narrative to explore the environmental changes wrought in California by European-American settlement. She glosses these themes with an animated flow of handmade images that evolve along with the spoken word. Three of Antebi's animated videos are projected on the same surface in looped succession. It is possible to sit down and watch the videos one after the other, and well worth the 18 minutes it takes. The stop-action animation process is labor-intensive. Think of the animated Wallace and Gromit series — on the screen, the projected image seems effortless and utterly natural — yet it is the result of slow, painstaking work. In each video, stories trace the outcome of past policy decisions regarding California's natural resources and their unforeseen consequences. An Australian exotic plant is introduced to Californian soil; a valley renowned for its legendary beauty is dammed to create a reservoir. In 1913, William Mulholland brings water to the Los Angeles Basin. Legends swirl in the wake of these events, and Antebi's moving pictures lend them lively form. The videos bristle with reference. Antebi cites everyone from Frank Black to an anonymous Renaissance author, moving between literature, botany and political economics. But they always return to the foundations of Californian wealth: land and water. The tone is donnish, the narrative voice itself intimate and conversational — more Ira Glass than Walter Cronkite. You may have heard of library music? This is what you might call library art, in love with the romance of scholarship and archival research. The research itself is even animated so that uncovering the story becomes the story itself. The videos come with charming visual bibliographies, with the camera panning hand-drawn book facsimiles in the closing scenes. At times you get the feeling that this information could become a cultural studies dissertation. However, with the imagery's insouciant appeal, we're lucky it did not. While there's no actual sewing, the animation's measured tempo recalls the quiet pacing of textile arts and sewing implements crop up. A headstrong thread unspools itself and undulates to assume the shape of titles that, once read, unwind. The artist leaves us with a sense of the fluid gestures of needle and thread — their ability to transform, to do and undo. Many of these moving pictures do the same. At one moment in "Folly Gardens" (2013), delicate pen-and-ink drawings are amended with an opaque milky fluid that looks like Wite-Out and a dark thread appears, forming the word "stories." The thread then forms a small lasso that settles over the lips of a pencil portrait of John Muir. When it crosses Muir's mouth, we hear his words as the portrait's lips move. In another scene, the environmentalist argues for the preservation of the Hetch Hetchy Valley in a forceful whisper while his opponent, U.S. Senator and ex-San Francisco mayor James D. Phelan, remains silent on the other side of the page. Micro-dramas like this one enliven the narration throughout. Antebi's animations share a shape-shifting tendency. In the 2013 video The Eucalypt, the camera scans black and white photographs of cloudy skies at close range before drawing away. Drawings of eucalyptus trees appear and grow, as we watch. Fragmentary words form in the sky: "the eucalyptus," "from Australia to California 1865," and "over 800 species." Meanwhile, the speckled strips of paper that form the trees' outer layers flake and fray. The bark's tattering action mimics the way these moving pictures continually change and replenish themselves, with a soundtrack of peeling, creaking and unwinding. Animistic Thinking and Landscape: Videos about California History and Mythology runs officially through Nov. 5 at the College of the Redwoods Art Gallery, but you can still catch it from 10 a.m. to noon on Friday, Nov. 6 and Saturday, Nov. 7.